2 PK BioFreeze Professional Roll On 3 fl oz (Green) Exp.2019+-Depends On Us! As soon as you feel a cramp coming on, use Theraworx Relief to release muscle tightness and to reduce the soreness afterward. With Theraworx Relief. How to Use Theraworx Relief. Proven Muscle Cramp Relief. Feature : Biofreeze Professional Cold Therapy Pain Reliever is a clinically optimized version of the traditional Biofreeze formula and provides your patients with a longer lasting experience and easier application due to its smoother consistency. Just pour it in a glass of water and swallow, or place one powder on your tongue and follow with liquid. BC Powder is fast pain relief at the speed of powder. Temporary Relief of Minor: Body Aches & Fever. Biofreeze 360 degree 4 oz Spray Pain Relief - FREE SHIPPING - PROFESSIONAL ! Biofreeze Spray. Lowest Prices on Theraworx Foam & Spray. ALWAYS FRESH ! NEVER SHORT DATED ! ALWAYS SEALED. ALWAYS NEW - NEVER USED. 5 out of 5 stars - Biofreeze 360 degree 4 oz Spray Pain Relief - FREE SHIPPING - PROFESSIONAL ! 123 product ratings123 product ratings - Biofreeze 360 degree 4 oz Spray Pain Relief - FREE SHIPPING - PROFESSIONAL ! The Biofreeze Cryospray is the perfect blending of science and nature.Active Ingredient Continuous spray removes the need for repeat pumping. Enables user to access hard to reach areas. CryoDerm pain relieving roll-on is the one used across the USA by chiropractors, massage therapists, physical therapists and sports teams to help relieve muscle and joint pain. It goes on cool and then almost creates a "mask" helping to block the pain. Trending at $24.22eBay determines this price through a machine learned model of the product's sale prices within the last 90 days. Cold therapy pain relief. apply form any angle. Relief When You Need It! Badger Bill created this original sore muscle rub to soothe his aches and pains from regular Aikido practice. Now it’s your turn to benefit! Experience the power of Cayenne and Ginger to soothe away stress and sore muscles. This product is not intended to diagnose, treat, cure or prevent any disease. For external use only. Keep out of reach of children. - redness is present. - when using for pain of arthritis if - condition worsens. BIOFREEZE 4oz Tuve. GENUINE PROFESSIONAL BIOFREEZE. NEW 4 OZ Gel Tube BIOFREEZE. PEOPLE ALL OVER THE WORLD USE BIOFREEZE FOR PAIN RELIEF. BIOFREEZE CAN ALSO BE APPLIED TO THE Professional 4oz Tube. Trending at $1.92eBay determines this price through a machine learned model of the product's sale prices within the last 90 days. Heading Icy to dull the pain, hot to relax it away. Goes on ICY to dull the pain. Allergy alert: If prone to allergic reaction from aspirin or salicylates consult a doctor before use. If pregnant or breast-feeding, ask a health professional before use. 2 Max strength pain relievers - Advanced relief for tough pain. Advanced relief for tough pain. Relief that lasts for hours. Icy To Dull The Pain. Hot To Relax It Away. Pain-relieving cream. Trending at $8.09eBay determines this price through a machine learned model of the product's sale prices within the last 90 days. 5 out of 5 stars - 4X Premiere's Pain Spray Relief of Minor Aches Pains 4 fl oz Four Bottle DEAL! 27 product ratings27 product ratings - 4X Premiere's Pain Spray Relief of Minor Aches Pains 4 fl oz Four Bottle DEAL! Biofreeze Pain Relief 3 oz. Roll-on Professional FREE SHIPPING - ALWAYS FRESH ! Biofreeze Pain Relief 3 oz. ALWAYS FRESH ! ALWAYS NEW - NEVER USED. ALWAYS SEALED. 5 out of 5 stars - Biofreeze Pain Relief 3 oz. Roll-on Professional FREE SHIPPING - ALWAYS FRESH ! 75 product ratings75 product ratings - Biofreeze Pain Relief 3 oz. Roll-on Professional FREE SHIPPING - ALWAYS FRESH ! Reumakit es una fórmula única de alivio del dolor diseñado para reducir el dolor de las articulaciones relacionado con la artritis, el reumatismo, lumbago y otros problemas en las articulaciones. Reumakit es 100% Natural Extra Fuerte Artritis Herbal Fórmula Le ayuda con reumatismo, bursitis y Lumbago. Expiration date: 04/2021. It is New in Box. Easy to use roll on. WE SOLD 423 OF THIS ITEM. Expiration is 2019. Features CryoDerm cryotherapy products provide fast acting, deep penetrating, long lasting pain relieving cold therapy that is clincally proven Use CryoDerm for soft tissue injuries, muscle strains, sprained ligaments, neurological conditions, arthritic bone and joint conditions, tendonitis, neuritis, bursitis, neuropathy, neuromas, and plantar fasciitis. The secret of this pain reliever is its deep penetrating, long lasting cold sensation. Product Details Product Dimensions: 1.75 x 3.25 x 6.25 in Product Weight: 0.75 lb Brand New! Authentic! Fast and Free Shipping! Clear, non-staining. Pleasant scent. No need to rub in. Easy to use. Directions Adults and children over 12 years: Roll directly onto affected area without the need to rub, massage or bandage. Children 12 years or younger: Ask a doctor. It is a no-drip, non-staining spray. With the easy to use spray application, it targets areas of pain without feeling. For the temporary relief of minor aches and pains of muscles and joints associated with, simple backache, arthritis, strains, bruises and sprains. 3 Packs Of BioFreeze Professional 360 Spray 4 fl oz, Exp.2021+--Depends On Us!!! Maximum Strength 4% Lidocaine. Icy Hot Cream with Lidocaine 2.7 oz. Numbs away pain; penetrates to nerves. Numbs away pain. Temporarily Relieves Minor Pain. Apply a thin layer to affected area every 6 to 8 hours, not to exceed 3 applications in a 24 hour period. Trending at $10.14eBay determines this price through a machine learned model of the product's sale prices within the last 90 days. CryoDerm pain relieving prodcuts are used across the USA by chiropractors, massage therapists, physical therapists and sports teams to help relieve muscle and joint pain. It goes on cool and then almost creates a "mask" helping to block the pain. Directions Adults and children over 10 years: Apply generously to affected area. Massage into painful area until thoroughly absorbed into skin. Children 10 years or younger: Ask a doctor. Allergy alert: Do not use if you are allergic to salicylates (including aspirin) unless directed by a doctor. Aleve Liquid Gels are formulated with double the power to relieve pain and reduce fever simultaneously. The extra-strength formula is specially-developed to provide long-lasting and fast-acting relief for up to 12 hours. 2 Packs of BioFreeze Professional 360 Spray 4 fl oz, Exp.2021+--Depends On Us!!! Fast Freeze is an all-natural topical pain reliever. The formula was designed to provide longer lasting relief to areas like the shoulders, arms, legs, back, neck, knees, and elbows. It can be also used to treat sore muscles, sprains, strains, joint discomfort, tendonitis, and arthritis by dulling pain with a cooling sensation. Shooting Burning Tingling Stabbing Pain. Pain Relief Cream. Exp 07/2018. Fast-Acting Relief from. 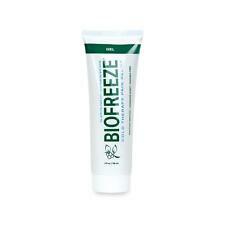 Biofreeze Professional Gel in 4oz Green Tube. Vanishing Scent. Expiration date: 11/ 2019. Experience the healing power of Emu Oil Blue-Emu Pain Relief Spray Maximum Strength. Topical analgesic spray which contains 10% trolamine salicylate. For temporary relief of minor aches and pains of muscle and joints associated with simple backache, arthritis, strains, bruises and sprains. Biofreeze is the pain reliever of choice for chiropractors, podiatrists, physical therapists, occupational therapists, massage therapists and athletic trainers. Keep plenty on hand with our Biofreeze 4oz tubes. This Biofreeze 32 oz. pump bottle is 100% paraben-free and preferred by 4 out of 5 users to the old Biofreeze. 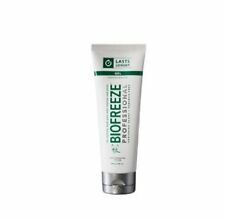 Biofreeze Pain Relief Colorless Gel applied from a tube or pump bottle affords the you the opportunity to create a more thorough application by massaging the affected area during application. "Sportscreme Deep Penetrating Pain Relieving Rub-3, oz."